After the Thanksgiving holiday, most of us start thinking about the next celebratory occasions on the calendar. That means rummaging around in the attic to find all those decorations you don’t get to use any other time of year! But that’s where things can get tricky if you rent a home rather than own one. More often than not, there are certain modifications you can’t make per your rental agreement, like nailing something into the walls or using adhesive strips that might end up taking some of the paint with them when it’s time to detach. Don’t worry – our staff has a few suggestions for some long-term rental-friendly holiday decorations, so you can keep the season bright! You can’t nail anything into your walls or door, which rules out any wreaths, right? Actually, no! It’s easy to turn your holiday wreath into a long-term rental-friendly decoration; all you need is some strong ribbon, wire, and an appropriate place to hang it. Using the branches on the back of your wreath make a wire loop and leave enough room to thread that ribbon through it. Then, tie it off and hang your wreath wherever suits you and your housemates. You can even pick up a few smaller ones and hang them throughout your home this way, rather than try to attach one to your front door. Christmas lights aren’t just for your tree – these whimsical bulbs can brighten up any of your rental home’s spaces! Find the rooms you’d most like to light up during the holiday season and make sure there’s an outlet within easy reach. Then, use the wires as the strand’s anchor, rather than putting any nails or hooks in the wall to secure them; you can do this by wrapping them around a banister, draping them across a curtain rod, or even arranging them in window sills or in decorative bowls. This is the season to hang your stockings with care… or not. If your rental home lacks a fireplace or other more appropriate place to display a stocking, branch out! The garment’s shape makes it ideal for a number of different decorating options, like a festive place to store your remote controls or covers for wine or liquor in the kitchen. Smaller ones can even be employed as a pocket for your utensils in place of a napkin when you need to set the table for company. 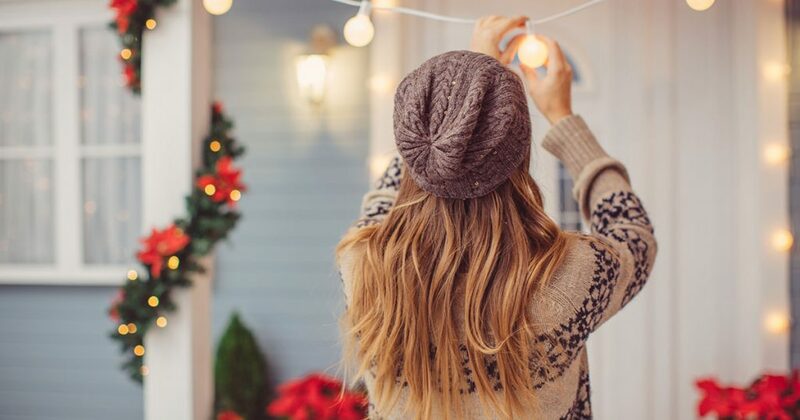 No matter what holidays you celebrate, or your level of decorating expertise, there are always methods for introducing a bit of seasonal cheer into a long-term rental home! Part of it lies in finding the right one for you and yours from the very beginning. If you’re looking for the ideal long-term rental in coastal North Carolina, contact our office to get started. And hopefully, you’ll be showing your friends around your new digs by the holidays!